Optimal Chiropractic, Station Road, Ballincollig, Cork. Symptoms are the body’s way of alerting us that something is wrong. Pain is a symptom. Problems can build up unnoticed overtime and symptoms make themselves known in a big way. It’s important not to ignore pain symptoms. Numbing the pain with painkillers or hoping that it will just go away is futile. Don’t ignore the alarm when there is a fire to put out. 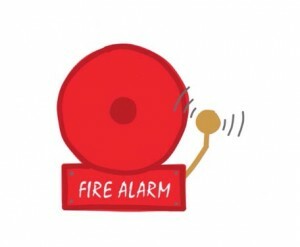 “To get rid of the problem, we must put out the fire, not just turn off the alarm”. Dr. Benjamin Martin is a Chiropractor and speaker on Health and Wellbeing. Ben is regularly called on to discuss health topics and chiropractic on radio, tv and press. His promise is to adjust and educate as many families as possible towards optimal health. His work changes lives and has restored people's quality of life. Get My FREE E-BOOK "52 Simple Lifestyle Changes" plus our monthly newsletter with helpful articles, recipes and special offers. I agree to have the above data sent to MailChimp. © 2019 Optimal Chiropractic. All Rights Reserved. A free e-book "52 Simple Lifestyle Changes"